You never know what you'll find at a flea market, and September's Texas Antiques Week in Warrenton was no exception. While I was strolling the wares laid out over acres of farmland with Scott Stephenson (the husband of the famous and fabulous Vintage Laundress, LeAnn Stepenson) and his lovely kids Olivia and Noah, just what do we fall upon but this aluminum coffin. The vendor suggested using it as a drink cooler at a party, but Scott, being the good sport that he is, hopped in and tried it on for size! There's a note above it that says: " Great gift for the future ex-husband." Well I can say Scott's definitely a real keeper, but when we went to see if the ghoulish find was there the next day, it wasn't! 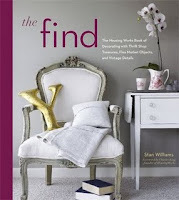 When you're finished here, be sure to head over to Fiona and Twig for a fabulous giveaway that includes a copy of The Find: The Housing Works Book of Decorating With Thrift Shop Treasures, Flea Market Objects, and Vintage Details! On one of last week's final Indian Summer days, I took a sun-drenched stroll through New York City's East Village and happened upon La Plaza Cultural Armando Perez. Now I'm certain I've walked by this corner many times, but I can't imagine how I managed to miss this massive display of trash turned into a whimsical wonder. The fairy tale botanicals twist and climb atop the fence encircling the community garden and gathering spot, and made me imagine the kinds of objects The Tin Man from "The Wizard of Oz" might be inclined to make. Who ever is responsible for this work of street art took great pains in cutting tin cans of all shapes and sizes, fashioning them into flowers, and embellishing them with wires and paint. 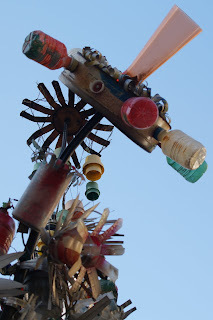 Even old plastic detergent and vegetable oil bottles transform into funny faces and fantastic spokes on magical wheels, and container lids become colorful pendants, hung at interesting intervals through out this trash heap turned fence garden. I was so taken with this sculptural fantasy that I'd like to share some of the photos I captured. Doesn't this just make your imagination wander? The very best thing about window shopping is that it doesn't cost a dime. And when it starts nearing Halloween in New York City, goblins and ghouls appear in all the shop windows, frightening the unexpected at every turn. Even where I live on Bleecker Street, you only have to walk half a block to get the wits scared out of you in the displays at the contemporary apparel shop Atrium. A veritable haunted house beckons with a horrific skeleton stuffed into an old suitcase or a sweet wicker basket pouring out frightful skulls! Designer Marc Jacobs got into the act at in all of his stores a little farther West, where zombies loom and grab at unsuspecting prey. 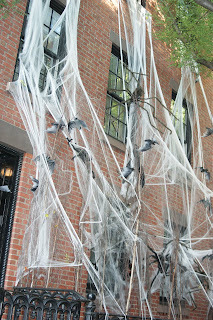 And just around the corner was a townhouse completely covered in gigantic furry spiders and their tangled webs. Muscle up your courage, and if you dare, take a spirited tour with me as we stroll through my neighborhood for freakish frights and scary, scary spooks. 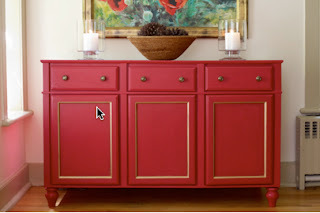 They say imitation is the most sincere form of flattery, and such was the case two-fold when This Old House magazine used The Find: The Housing Works Book of Decorating With Thrift Shop Treasures, Flea Market Objects, and Vintage Details to inspire a cheery, DIY console featured on its website right here. The original credenza featured in The Find was re-visioned by Carl & Co.'s Mark Ciolli for a client who fell for an André Arbus original, but not the $86,000 price tag. 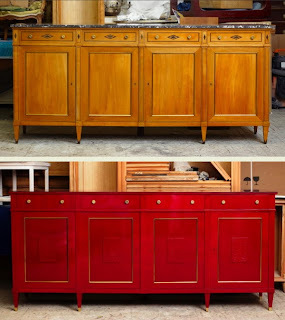 So Ciolli worked his thrifty magic to locate an 82-inch-long, 1930s Belgian model for a fraction of the price, and Osmundo Echevarria's studio started re-finishing, applying layers of lacquer, goldwashed hardware and shelves lined with fine Venetian paper, resulting in the glorious red credenza shown on page 73 of The Find. estimate to cost about $400. This weekend a box that my parents and my sister packed with birthday goodies arrived from my hometown of Independence, Mo. On top covered with wax paper were two plastic bags full of Rice Krispie Treats, something my dad likes to send me on occasion and a snack we adored when I was a kid. Also, there were two containers of unsalted peanuts, another of my favorite snacks, and then a glass mug from the beloved Tiffany's Attic dinner theater that once stood on Kansas City's Main Street. When I was a kid, going to the dinner theater was a fancy occasion that we anticipated with excitement, especially if the show featured the Vaudeville performer Billie Bird. For all these years, my mom has saved this mug from one of those special family outings, and then sent it to me. It's printed with the face of the zany character actress we saw onstage in shows like "Arsenic and Old Lace" and "Busybody." We'd get so tickled by her craziness that we could hardly catch our breath during the show, and giggled for days recounting her silly antics. Also in my box was an old loomed potholder. We used to make these when we were kids, but I don't know whether this is one we actually made, or one that Mom has collected over the years. Along with the book, Strengths Finder 2.0, my sister Cheryl added a special card she made from a family photo. Pictured next to me on the left is my Grandma Williams, Mom and Cheryl, holding her dog Gypsy. My Aunt Lorene, who we used to call Snowball, in the pink dress in the center aside Dad. It was 1986 -- the summer I returned from my studies at the University of Bordeaux, France, we made a family trip to see my Grandma Williams in Mulberry, Ark. Note the 1980s hair that I had tons of, just like my Grandma. Now Grandma, Snowball and Gypsy have all long passed. And the rest of us look a little older -- or mature, I should say -- except for Dad, who seems to have barely aged over the past 23 years and still has a head full of barely grayed hair! This old photo brought back memories like it was yesterday....the sticky, humid air blowing out of Grandma's water cooler, my grandfather's old 1977 Chevrolet Impala, the framed, light-up print of Jesus above the living room sofa, Grandma's just-done hair-do, the bright red-carpeting in her guest bedroom and the smell of beans on the stove and cornbread in the oven. 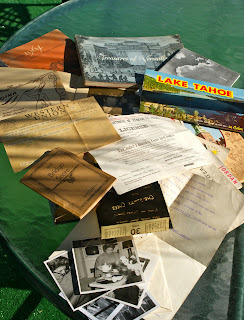 I couldn't have received a better box of treasures -- a true offering of cherished memories on which no one can place a price tag. Again, I feel compelled to share with you my thankfulness to everyone who has purchased a copy of The Find: The Housing Works Book of Decorating With Thrift Shop Treasures, Flea Market Objects and Vintage Details. For many of you, I've been honored to write a personal message within its pages, while others, even though I feel like we've been friends since childhood, I haven't yet been graced with the opportunity. Lately, many of my dear friends in Blog Land have offered to mail me their books to sign for them. I would gladly accept the offer, but then I started thinking about how much money it takes to mail a book back and forth across the country. Believe me, I know first-hand how much shipping these books around can cost! And then, how horrible I would feel if a book got or damaged in the mail. So to make the process more simplified and safe, and to ring true with The Elegant Thrifter message of frugal and fabulous living, I designed plates for anyone who wants me to add a personal message to The Find. And I'm proud to announce that the first person who'll be sent The Elegant Thrifter plate is none other than glitter-iffic Sonya over at Dime Store Thrift. 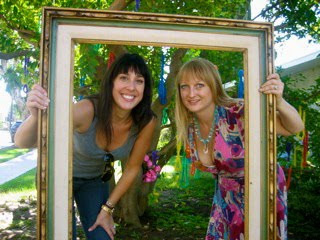 Sonya was among the first few bloggers, along with my treasured LeAnn Stephenson TheVintage Laundress, to find me in Blog Land. The two of them have done so much for me over the past year that I should put them on the payroll -- if there were one! Would you like your own personalized plate? Just email me your address and I'll pop one in the mail especially for you or a loved one ... or even someone you don't like so much! Got a ghoulish skull candle that needs a spark of pizazz and a scintillating sizzle? 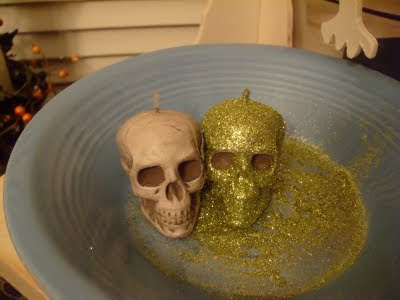 Well, if you're M.L over at the House of Whimsy, a little dip into a bed of green glitter can turn a bland, ordinary skull into a spook-tacular object of luminary qualities. When it comes to crafts, I say, if in doubt, glitter it. I have this running conversation with Sonya over at DimeStoreThrift about the virtues of glitter. Why, I've seen the sly and crafty Sonya apply massive amounts of the sparkly stuff to a plastic reindeer as well as a candle holder to much shimmery success. Recently, when she acquired a demonic looking Santa Claus and asked for advice on how to soften his harsh demeanor and enliven his spirit, I offered my take: "Glitter Him! Glitter him! Just dump him in a tub of glitter and go for it! I dare you! I beg you!" If you live in a locale not known for good garage sales, but have the itch to rid yourself of clutter and make a few dollars at the same time, then maybe it's time to call in a favor from a friend who lives in a neighborhood known for its treasure trove of thrift shopping. That's exactly what Jonamor Décor's Senor and Jonona Amor did last weekend when they decided to clean out their storage and sell their fabulous fare. Ruth Handel, the queen of all garage sale shoppers, agreed to let the couple lay out their wares at her retro-tastic Mar Vista home, causing thrift shopper shock waves throughout all of Los Angeles, Orange County and yes, New York City. Ruth said the prices were amazing for some of the best finds ever, and what started out as several truckloads of merch dwindled down to next to nothing, and lasted two hours longer than planned. Before all the goodies vanished, Ruth snapped some pictures and sent them my way. Some of my favorite friends showed up to join in on the merry money-making and bargain shopping! There's my pal Robyn Goldberg, the incredible Hollywood stylist, perfectly framed with Mrs. Amor. Garage sales aren't all about shopping. They're also a great way to meet people who might just live across town. 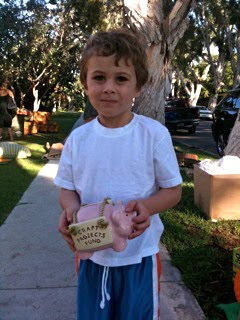 And oh, look, there's Ruth's son, the adorable Jobim Scott, guarding the profits in a piggy bank! • Invite your hosts to add their own items to your sale. They might appreciate the opportunity to easily unload a few items, and make a couple dollars as well. • As silly as it might sound, make sure you and your team are there the entire time to make sure everything runs smoothly, especially during the set-up and breakdown. • Provide snacks, beverages and lunch. It's just the gracious thing to do. • Organize, organize, organize in advance. 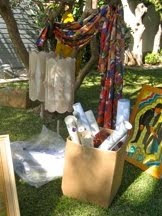 Bringing a load of stuff to dump on someone's lawn can be an ominous sight if it looks like junk dragged out of the garbage instead of valued treasures. • Make it pretty and appealing! With your host's permission, of course, hang fabric in trees and decorate the shrubbery, group items by color, display like items together. Just like when shopping in a store, potential buyers are more inclined to buy if the goods look gorgeous! • Give your hosts first dibs on the goodies, and allow them to pick out an item or two as a thank-you for their generosity. "I picked an over-sized white ceramic apple with shiny gold accents," Ruth wrote me from a sunny spot during her family's Hawaiian vacation. "It has pinholes for fruit-laden toothpicks for party time!" Now I want to go to that... party! Uh...garage sale! Well, actually both! The Find: Don't be a Thriftzilla! I've said it before and I'll say it again, you'll most certainly be rewarded when you consistently create positive, thrifting karma. I know, I know. We all have moments when we turn into Thriftzillas -- the glutenous thrift hoarder gobbling up all kinds of shiny goodies in our paths. We see all kinds of objects that tempt us with their inexpensive prices and vintage charm, all of which triggers that collecting mechanism that makes us want to own it all. Sometimes we feel like grabbing everything laid out in front of us, quite often leaving nothing for the next poor soul just looking for a little thrifty morsel or two. Just witness this crazy 1970s dresser that Bob Greenspan photographed for The Find: The Housing Works Book of Decorating With Thrift Shop Treasures, Flea Market Objects, and Vintage Details in the Los Angeles home of Jonamor Décor's Senor and Jonona Amor. And where did I spy this potential pairing? At a Housing Works store here in New York! It's the credenza from the same family as the dresser Bob shot for The Find, and it appeared right in front of me, thousands of miles away. Keeping my inner Thriftzilla at bay! For whatever reason --whether it's the moon and the stars aligning in a specific combination or the fact that time continues to creep up on me and all the that I seek to do in life -- I get a little sentimental and homesick for my far-away friends and family as my birthday hovers. And while objects are just objects -- stuff printed on paper, plastic formations, shaped glass or worn fabrics -- the memories they evoke are as vivid as yesteryears, sometimes heartwarming or bittersweet, and quite often spirit-lifting and inspirational. Here's the corner of my desk (on a neat day) where I keep that inspiration at my fingertips. On top of the pile, of course, is my labor of love, The Find: The Housing Works Book of Decorating With Thrift Shop Treasures, Flea Market Objects, and Vintage Details. Every time I leaf through the pages of this well-used book, I'm encouraged that I am capable of almost anything I set my heart on. I had never written a book before this one, am not a decorator and am a complete unknown in the world of home interiors. Sometimes I have to remind myself that I wrote a book! And it was published! And it is still selling! Just underneath The Find is a "Hints from Heloise" day calendar that I scavenged out of a junk box at a garage sale with my cousins in Independence, Missouri, and then the retro-interiors -packed Barbara D'Arcy Bloomingdale's Book of Home Decorating that my beloved Jonamor Decor pals Senor and Jonona Amor offered a couple of years ago. Next comes an issue of House Beautiful featuring David Jimenez's Kansas City home, the same one featured in The Find; an issue of Domino (RIP), and a copy of Real Simple that showcases Housing Works' Design on a Dime yearly fundraiser. On the bottom of this stack rests two of my most adored examples of ephemera. First is a concert album from Dolly Parton's 1977 "Here Your Come Again" tour that Senor found at a thrift store in Texas. The year of the concert is significant for it was the first time I saw with my family Dolly perform live at American Royal Horse Show in Kansas City's Kemper Arena. I still have a freebie program from that show, but this is the deluxe edition that we could not afford to purchase at the time. Below it is the souvenir album from her "Backwoods Barbie" tour, the last time I saw Dolly in concert just about two years ago. Let your eye linger over to the desk corner where I've taken an oblong vase and turned it into an inspiration box. Among its contents are a photo of a friend's twins; a 1986, 45rpm by my favorite French pop singer, Arnold Turboust, which I bought when I was a student in Bordeaux, France; and a catalog from the fabulous exhibition of New York artist, Kehinde Wiley' at the Studio Museum of Harlem. Next to the glass box is a plastic mug from Dollywood, the amusement park created by Dolly Parton herself. I've said many times how much Dolly inspires me with her rags-to-riches story, one filled with kindness to others and a persistence of following dreams. It was in the late 1980s when I flew to Nashville to meet my parents for a family vacation, unfortunately minus my sister, and then from there, we headed off to Pigeon Forge to visit Dollywood. I probably bought a big iced tea in this mug, and have saved it to this day, along with shopping bags, brochures, notepads and other memorabilia that I treasure from the last family trip we made together so long ago. When I glance at these items, rifle through their pages or take a pencil from the plastic mug, I'm reminded of where I am from and what makes me happy, and comforted in knowing that even as I get older, the memories collected along the way never fade or wither, and are as crisp and bright as the day they were made. Now who doesn't love a celebratory tabletop that conveys a consistent, established theme from the moment the invitation is sealed and stamped to the arrival of the big day when excited guests arrive and are awe-struck by the glorious scenario that awaits them? I felt like a guest at such a party when I perused the tabletop competition at the Los Angeles County Fair back in September. There were dozens of fanciful and festive displays set up and imaginative ideas abound, but this First Place winner caught my eye among the rest for demonstrating how to add an innovative spark to what you have might lying around the house or stuffed into cupboards and turn it into a fabulous fête for a special girl or boy. 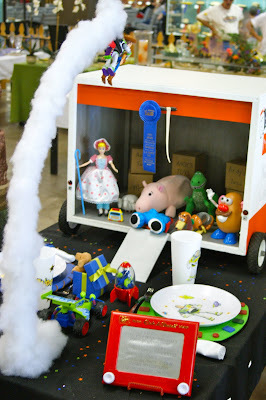 A certain Cristel Schoenfelder received a perfect score for her "Toy Story" inspired party setting. I can imagine that she might have found her inspiration in a child's toy box, and then built her entire tabletop based on her established theme. 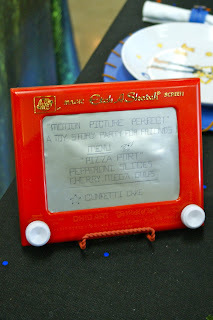 A stand-out among this tablescape is the menu displayed on an Etch A Sketch. I can't imagine physically twisting and turning the knobs on this gadget to write out the menu out on this screen, and neither could she, apparently. Instead, she took graphite colored paper and mimicked the writing that one would achieve when using this classic toy. It fooled me and my pal Ruth Handel for a few minutes as we oohed and awed over this thrifty gift of a table setting! 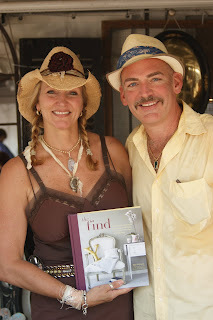 A pretty lady in a cowboy hat came to see me at a party that Theresa at Garden Antqs Vintage threw during the recent Texas Antiques Week to celebrate The Find: The Housing Works Book of Decorating With Thrift Shop Treasures, Flea Market Objects, and Vintage Details. The hatted lady introduced herself as Donna Fussell and invited me to drop by her booth, Reborn Rubbish, at the nearby Hillcrest Inn. So with book in tow, and The Vintage Laundress, LeAnn Stephenson, leading the way, we trudged off the following day and happily weeded our way through tables laden with fabulous finds, odd knickknacks, unusual "junque" and funny gee-gaws, until we spied Donna from the night before arranging her wonderful wares on the wooden front porch of the inn. 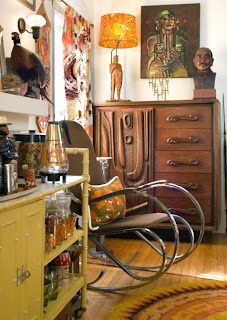 Donna, quite simply, is a master of repurposing, taking vintage objects and whimsically breathing fresh life into them. Nothing she offers is too complicated or too tricky, but what she proves is that a fresh eye and a mind full of ideas can turn one person's castoff into another's pride and joy. 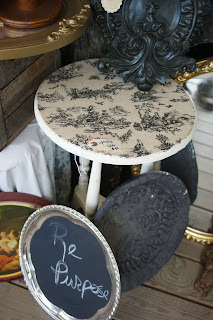 Take for instance this silver tray and toile covered table. Basically, you could take any type of tray, silver, tin, plastic or wood, and paint it with blackboard paint to create a fabulous message board. And the lowly wooden table gets a beauty school makeover with an application of glorious toile paper. Hanging from the ceiling is a fanciful wind chime/candle holder that's fashioned out of an old bottle that was cut and etched. 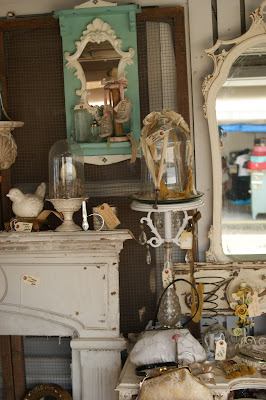 Nearby this tinkling treasure was a vignette absolutely teeming with innovative re-purposing ideas. A coppery metal base of an old Victorian lamp becomes the perch for a porcelain bird; a vintage church hymnal is decoupaged onto the surface of a glass vessel, and a wooden, Irish spool is smudged with a bit of pink paint and turned into a pedestal for a precious pair of antique baby shoes. Everything in the booth had a re-purposed polish, from the crystal candle holder that's artfully affixed to a patina-packed table leg to handmade doilies carefully attached to make apparel pieces. There's no rubbish left here! It's all become a treasure-seekers dream. Fabulous & Frugal Fun: Hey Doll Face! I recently told you about the thrift trance that overcame me a few weeks ago as I entered a room full of ephemera at an estate sale in the Pacific Palisades. Well, here's a little something that contributed to my altered state. This doll tree was right outside the door of the ephemera room in the same home of a much-in-love couple who clearly adored world travel. Wherever they went, I like to imagine they carefully plucked their favorite dolls representative of the country they had visited, and then lovingly perched them on this funny, wooden tree. This might also have been one of their favorite holiday decorations. 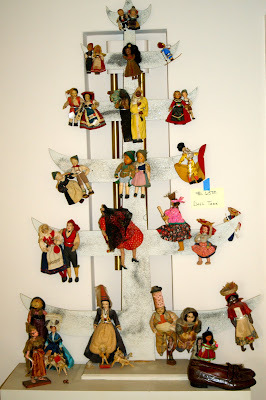 I'm especially attracted to this doll tree because it shows how a personal collection can be cleverly grouped and proudly displayed as a decorative object in a room decor. Now I don't know about the croc loafers sitting on the credenza, but the tree, at $65, was being whisked away by another couple as I was staggering out of the room full of old certificates and diplomas, vintage photos, travel brochures, love notes and hand-made Christmas cards. Over the past few weeks, I've been amazed by how many people are discovering The Find: The Housing Works Book of Decorating With Thrift Shop Treasures, Flea Market Objects, and Vintage Details. My publisher likened the phenomenon to The Energizer Bunny....it just keeps on hopping along even though it's been six months on the market. I owe much credit to all my friendly blogging pals and the press, which endlessly and graciously presents my labor of love to their loyal readers. I am so humbled, honored and thankful. Family Circle is the latest publication to feature me among a Farm Fresh entry in its November 1's "Pro Pointer's" corner. I'm so pleased that they also selected to show one of my favorite images from the book: a gorgeous vignette from the downtown home of Carl & Co.'s Mark Ciolli. My mouth starts to water as I just look at the cover of the magazine: -- a jack-o'-lantern fashioned out of orange and brown M&Ms. Yum! Also very sweet was a photo my friends on Long Island sent me from a Barnes & Noble in Boston. 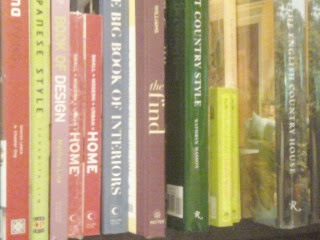 Wherever they travel, they seem to be on a mission to locate The Find and place it in a prominent spot among all the other home and design books! If you do the same, take a picture, send it to me and I'll share your kind gesture as well. On a final note, I received a plea from Ms Shopping Go Lightly of The Thrifty Chicks who is up for the honor of becoming the Next Green Girl over at Project Green Search. Go vote for her by following the link from her blog. As simple as it sounds, I feel that in these unsettled times, the moment has clearly arrived for us go out of our ways to help each other. Just like I believe in thrift karma -- not being greedy, remaining respectful of vendors' wares, not going into debt shopping and being patient for the just the right, affordable find -- good human karma always pays off -- and how! 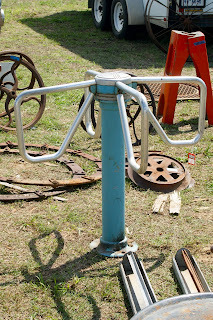 While perusing the wares sprawled out for miles around during the recent Texas Antiques Week, I was captivated by this vintage stadium turnstile sitting among rusty old wheels and metal scraps in the middle of a field. Even though this model probably dates back to 1950s, it still brought back so many memories of summer fun: waiting in line for a ride at Worlds of Fun, walking through the front entrance of the Kansas City Zoo, or even attending a Kansas City Royals game with my family. And I'm sure I even got into some turnstile trouble a time or two for hanging on the revolving arms or irritating my sister by trapping her inside. You know how kids are. I think the vendor was only asking about $65 for this incredible piece, but I couldn't imagine hauling it back to New York where this lovely metal piece was made many years ago. And once I got it back North, what would I do with it? I don't have so many guests that I need to control the crowd. Hmmm, could I fix the turning device and make it into a table? Or could it be electrified and refashioned into a chandelier? I passed on this glorious, eggshell blue memory maker, and when I went to visit it the next day, it had spun away with someone else! I wasn't disappointed, for I got to give it whirl in a field in the middle of Texas -- and take it's picture in this unusual locale. Now what are the chances of that ever happening again? As many of you know, I am not greedy with my thrift finds and love to give them away, especially if I discover an item of special meaning or is located in a particularly heartwarming locale. 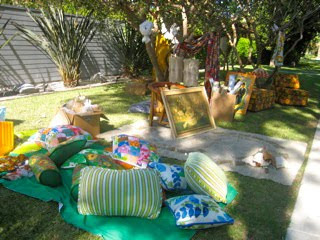 Such was the case when I ventured out to an estate sale with my garage-sale pal Ruth Handel. While in Los Angeles a few weeks ago, we headed up into the Pacific Palisades to a spot that was clearly the home of a couple who was very much in love. Of course, I immediately went into a thrift trance when I entered a room packed with ephemera -- old wedding albums, love notes sent via Western Union, invitations to birthday parties printed out by a ditto machine in purple ink, negatives from handmade Christmas cards, photographs of the couple at a Washington nightclub in the 1940s, and the list goes on. The husband was a well known doctor and patron of the arts and his wife quite the socialite and local tour guide. I could have spent hours weeding through travel guides from around the world, brochures from far-away places, notes, letters and priceless photographs, but here is a sampling of some of the items I brought home, for about $15. Of all the things I found on that magical day, a standout was this catalog, "Treasures of Versailles." It dates from 1962 when the some of the palace's finest objects went on tour of the United States. The tour, which made its way to (as they were called back then) The Art Museum of Chicago, Toledo Museum of Art, Los Angeles County Museum and The California Palace of the Legion of Honor, and was heralded as the largest collection ever allowed to leave France. The exhibition touched American soil at a time of disrepair for Versailles, and the French government was seeking ways to raise money for bringing the national treasure back to its former splendor. According to an October 1962 Life magazine the offerings included "Gobelin tapestries, carpets, furniture, drawings, paintings and sculpture from the reign of Louis XIV to that of his descendant, Louis Philippe, 200 years later." Almost 50 years later as I was preparing for my arrival in Austin chez LeAnn Stephenson, The Vintage Laundress, I thought this would be a fun gift for her, knowing that she, too, shares my love of everything French, especially the magical château where Marie Antoinette once lived. I wrapped my new treasure up in a Frenchy looking vintage scarf I found in a Long Island thrift shop, et voilà, one of my favorite gifts of thrift! Reuse & Repurpose: Get Out of Bed! Now what do you do with an old bed frame that just doesn't fit into your current home design? 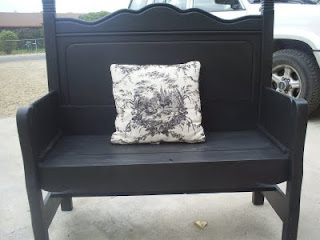 If you are Toni Cutts over at The Tattered Cottage, you give it a whole new life by turning it into an elegant bench! Above is her creation before she added a coat of black paint. 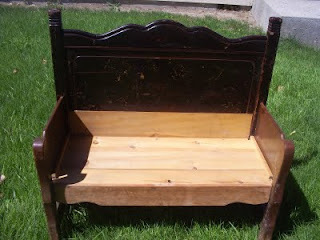 Note how she used every part of the bed, taking the headboard for the back and splitting the footboard for the arms. Her finished product is chic and modern, and would be impossible to buy new in any store. With a little bit of elbow grease and a whole lot of imagination, even thrift finds that appear to have lost their purpose find an entirely new life. 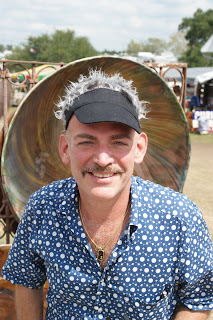 The sun bore down on those late September days that The Elegant Thrifter packed up his wares and and headed down to the Longhorn State for the Texas Antiques Week to join forces with LeAnn Stephenson, The Vintage Laundress. They set up their goods at The Texas Rose Antiques Show: he with copies of The Find: The Housing Works Book of Decorating With Thrift Shop Treasures, Flea Market Objects, and Vintage Details, and she with all her linen finery and china niceties. Their meeting was a match made in vintage heaven -- one that the thrift gods and LeAnn's husband smiled upon. The dynamic thrift duo milled about the tables set up for miles around and heaped with alluring treasures, picked through old cookbooks, admired kitchen knickknacks, laughed at funny doodads, and certainly enjoyed their fair share of canned diet DR Pepper and bottles of blush wine. And along the way they met all kinds of creative folks like Maggie from The Veranda in Canton, who can take almost any scrap of paper and turn it into a whimsical object of beauty. Oh... and they sold a book, a tablecloth and a napkin or two. I'm bushed with all the hard work I've put in over the past few weeks promoting my labor of love -- The Find: The Housing Works Book of Decorating With Thrift Shop Treasures, Flea Market Objects, and Vintage Details. But I couldn't be more thankful to all the people who've been by my side in both Texas and in Cincinnati. First of all, how can you not adore LeAnn Stephenson, the amazing The Vintage Laundress? She and her lovely family hosted me for several days in their fabulous Austin home and she promoted and sold The Find at her booth at the Texas Rose Antiques Show. Oh we worked hard....giggling at all the silliness at the market, oohing and aahing over all kinds of treasures and scheming about how we can collaborate on more "business" ventures! I truly feel like part of her family. Just look how hard I worked to grow that bush of gray hair. Unfortunately it came off with the cap. 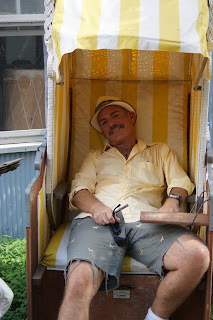 Then I was toiling away in this vintage cabana lounger. And Leann had to document my drudgery for all to see! threw a fabulous blogger party where I signed books and loved meeting each and every guest. 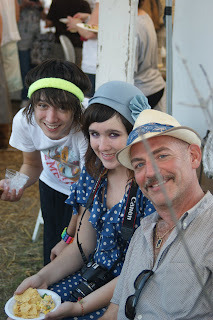 Here I am with Leann's and her husband Scott's super-cool kids, Olivia and Noah. Again, ahem, hard work! Can't you see the pain in my face? Despite a harried morning leaving for a 5:50 flight to Cincinnati, I made it to Bova Contemporary Furniture where the talented folks at Great Lifestyles Today included me in their amazing design event, featuring the creations of my decorating pal Mark Ciolli of Carl & Co. Here I am all cleaned up with Mark at the book signing I did there. Now it's back to the grindstone! them back hundreds of years as a saloon girl or Southern Belle or even a Civil War general or a cowboy.Park guests would line the deck of the Cotton Blossom (yes, the one that appeared in the film, Show Boat! ), or wait for hours in the hot sun in the Americana section waiting to have their vintage photo made. Each "Spittin' Image" location had appealing qualities. On a boiling day, the studio atop the boat was air conditioned and isolated from the park managers who roamed around looking for "Ambassadors" not wearing white enough sneakers or who had shaggy hair creeping over their collars. Tattoos and piercings? Why, that would have shot you out the back gate faster than The Orient Express, the four-looped roller coaster that once ruled the Orient section of the park. The "Spittin' Image" saloon front in the Americana area was right across from the Country Junction variety show where every two hours or so a live cast performed medleys of country tunes. We heard that jamboree so many times a day that we memorized the show, and on slow days would dress up in the costumes themselves and put on a show of our own! I was reminded of those summer days a few weeks ago while making my way through the Los Angeles County Fair with my pal Ruth Handel when much to our delight, we visited a shop that makes old-timey photos much like the ones I made more than 20 years ago. The technology has changed quite a bit from the days we took Polaroid images, sprayed them with chemicals and dried them with a crusty hair dryer. Now these tintypes are made digitally, but to this day, my thumbnails are damaged from holding the corners of these photos while spraying them with a rapid selenium toner to achieve a sepia effect. (We were provided with gloves, but nobody used them. You know how kids are!) Ruth snapped my photo in front of the photo booth. Note my gigantic lemonade and one of my favorite Dolly Parton T-shirts. I'm also sharing with you the cover of the 1981 Worlds of Fun Ambassador yearbook. There I am on a slow day in the top photo from that yearbook, dressed as a cowboy with a couple of my co-workers. I think I'm 16 in this picture packing heat, holding a noose and hiding my mass of hair under a crumpled cowboy hat. I have kept this yearbook all these year and dig it out on occasion to see how the park has changed. Gone is "Spittin' Image," The Cotton Blossom and The Orient Express, but all the fun I had at Worlds of Fun is still vibrant within its pages. The chill in the air this time of year always reminds me of the final days of the Worlds of Fun season, only to be repeated just a few short months later come Spring. 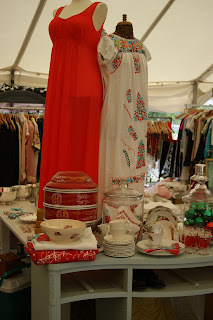 The Gift of Thrift: Another Eruption! 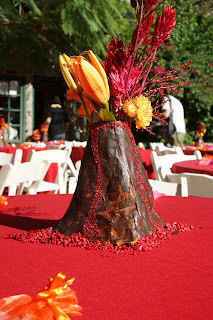 I wanted to share with you a couple of photos of the final stages in the creation of the papier mâché volcanos that I made for Jonamor Decor's Senor and Jonona Amor's "Fantasy Island" wedding last month. I built and painted all 21 hot lava makers, and Jonona added streaming touches of molten red glitter for a bit of extra sizzle. And then finally, the setting, complete with red and black aquarium rock. Truly an eruption of wedded bliss! For more thrifty party ideas, pick up The Find: The Housing Works Book of Decorating with Thrift Shop Treasures, Flea Market Objects, and Vintage Details at Borders, Barnes & Noble, Amazon or Powell's. Reuse & Repurpose: Hello Kitty!